Looks and feels like a designer ring, but it is a challenging puzzle ring. Bright Solid 925K Sterling Silver Ring with Pink Tourmaline. Sizes 5-11 Weight 6 grams. A Puzzle ring consists of from two to twenty four interconnected rings that, when correctly aligned, can be an impressive finger ring. When apart, it's difficult to believe they can be manipulated to form an interconnected whole. They were developed from gimmal rings, which derived their name from the Latin gemelli, meaning "twins". Gimmal rings were mainly used as wedding rings. Many are Italian or English from the Renaissance period. They are also sometimes called Turkish Wedding Rings or Harem Rings. 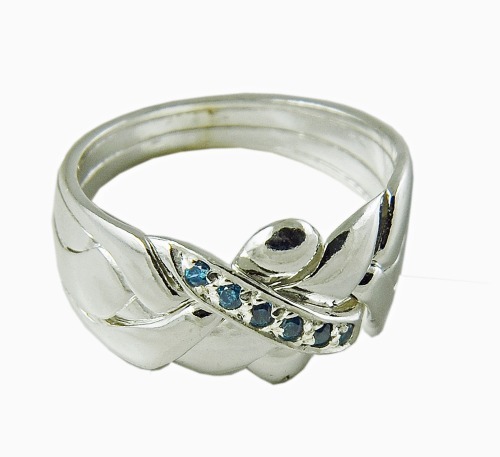 Traditionally, a birthstone is associated with each month of the year. For example, the birthstone for January is a garnet, while lucky babies born in April get a diamond as their birthstone. The origin of birthstones is believed to date back to the breastplate of Aaron which contained twelve gemstones representing the twelve tribes of Israel. The current list dates back to 1912 with only one addition since then – the tanzanite was added to December. There are numerous legends and myths about birthstone healing powers and their therapeutic influence. According to these legends, wearing a gemstone during its assigned month heightened its healing powers. For the full effect, individuals needed to own all twelve and alternate them monthly. DECEMBER. December birthdays have claim to three gemstones;Zircon, Tanzanite and Turquoise. Each of these gemstones carries a unique blue tone making it a perfect birthstone for Minnesota's frigid December winters. Zircon can be found in a variety of colors, but blue is the overwhelming favorite.